David Mach Will Scare You! His own gentle face will make you smile as you look at him, but then watch his giant sculptures, and shriek! Just on time for some Halloween scares, let's have a look at the animals Mr. Mach creates and fabricates with the most unusual of materials. 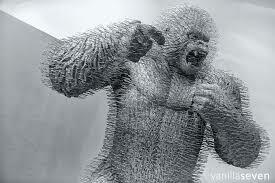 For example, his spiky cheetah and a tiger are entirely built with wire hangers. 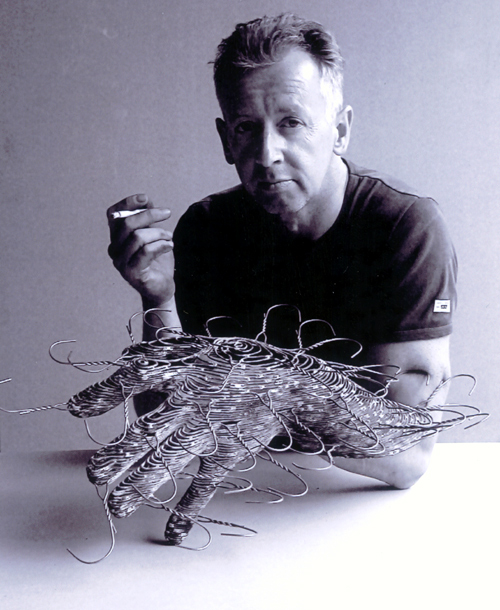 Are they still called sculptures or recycled masterpieces? In any case, they are frightening-looking, the kind one expects to see in an horror movie or a post-apocalypse scenario where strangely evolved beasts lurk in dark corners - maybe also have eaten all the humans on the planet. 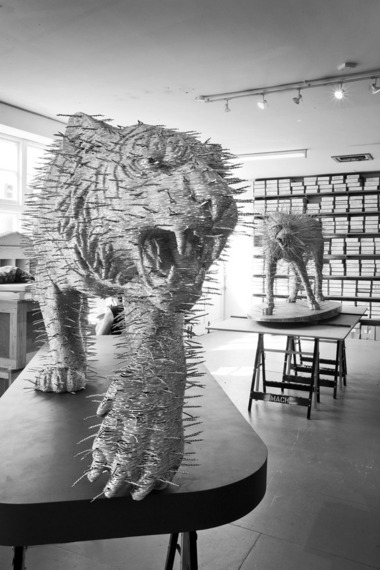 Part of a series baptized "Coathangers," the life-size beasts are made of metal/wire hangers, which has their pointed metal hooks sticking out of the "skin" of the animals. The slightly scary looking cacti-like creatures are created from a plastic mold, covered with the hangers, and finally coated in nickel. The final products resemble magnificently aggressive porcupines layered in quills nobody wants to pet! His "Silver Back" measures 7-ft by 9-ft by 5-ft and is made of 7,500 metal coat hangers. It took 2,705.6 man-hours to create, and it first went on display at the FIAC art fair in Paris. David Mach calls his work "Big on gesture and big in proportion, it demands your attention and gets it." The 60-year old Scotsman works out of his London studio with unlikely material recycled from the streets and the dumpsters. Wood, pipes, tires, bricks and furniture are used as well. His piece "A hundred and one Dalmatians" has flying washing machines incorporated in the sculpture. His "Out of order" line sculpture is made of red British phone booths. His version of the ancient Greek Parthenon, a familiar sight when looking at pictures of Greece, was perched on top of shipping containers to recreate the height of the hill in the actual setting of the ruin. For the artist, British-ness is well represented by bottles of HP sauce (a brown version of the American BBQ sauce), so he once requested the public's help to collect some 2,000 of such empty bottles to built a piece of art. The result was a weird version of the Union-flag. 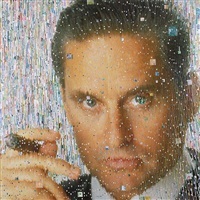 Michael Douglas/Gordon Gekko also has its very own rather prickly-looking version in a head collage made of postcards and cash. Scary stuff indeed! Happy Halloween! On November 26 and 27, David Mach will have an open studio at 8 Havelock Walk, London, SE23 3HG, UK. Tel: 44-0-208-699-5659. Master classes in drawing and collage will be held at the studio during extended weekends from Nov. 18th to January 22nd.